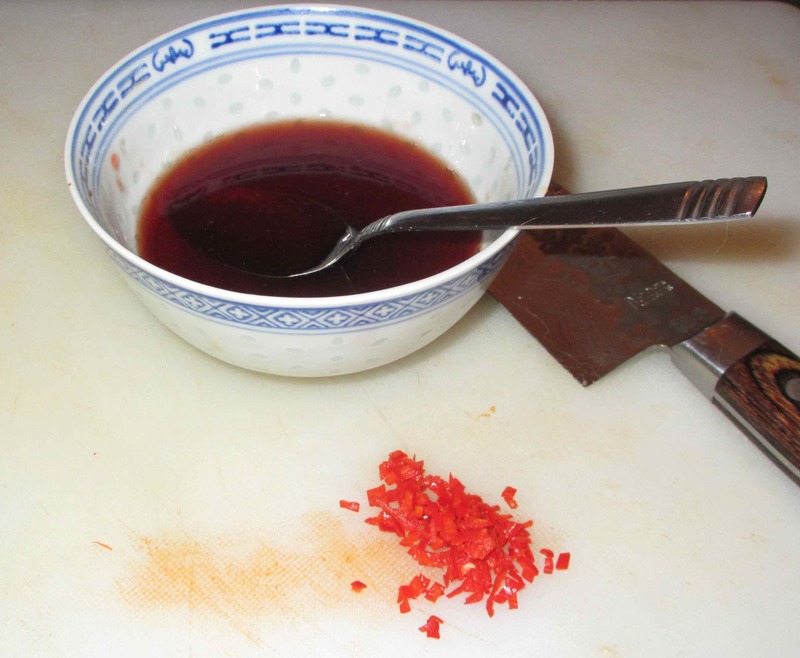 For a sauce, I heated up some Red Currant Jelly to melt it and then mixed in a few tablespoons of Shaoxing Wine and two minced Thai chilies. The actual construction is fairly simple. 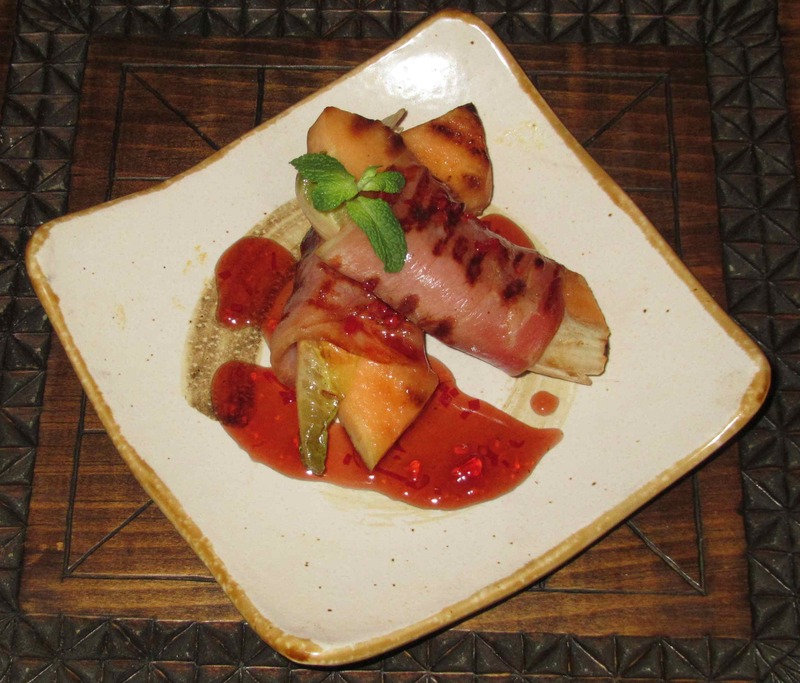 I recall once seeing pear and prosciutto wrapped with red endive and I thought that some leaves of green endive, which I happened to have for another use, might add interesting textural and flavor counterpoint when grilled along with the other ingredients. 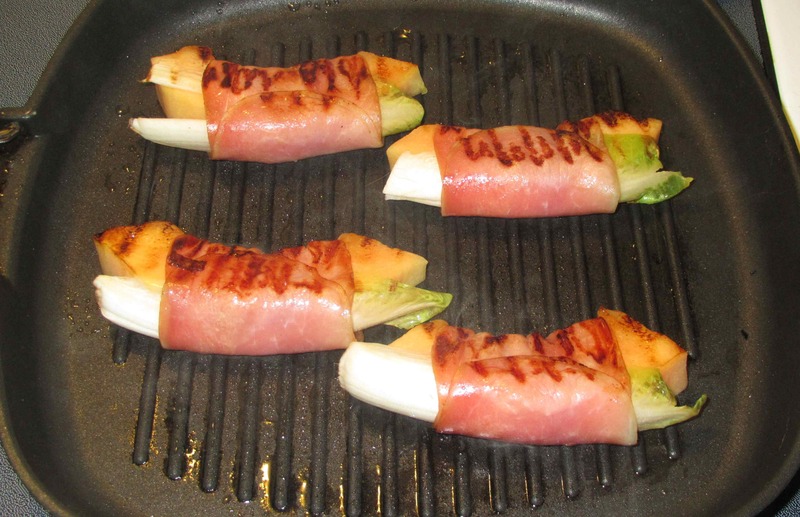 Once wrapping the meat slices around the melon and endive, I did nothing else other than brush lightly with a thin film of oil and then grill for about two minutes on both sides. Very creative! The plate arrangement can be improved! For sure… not one of my better efforts. 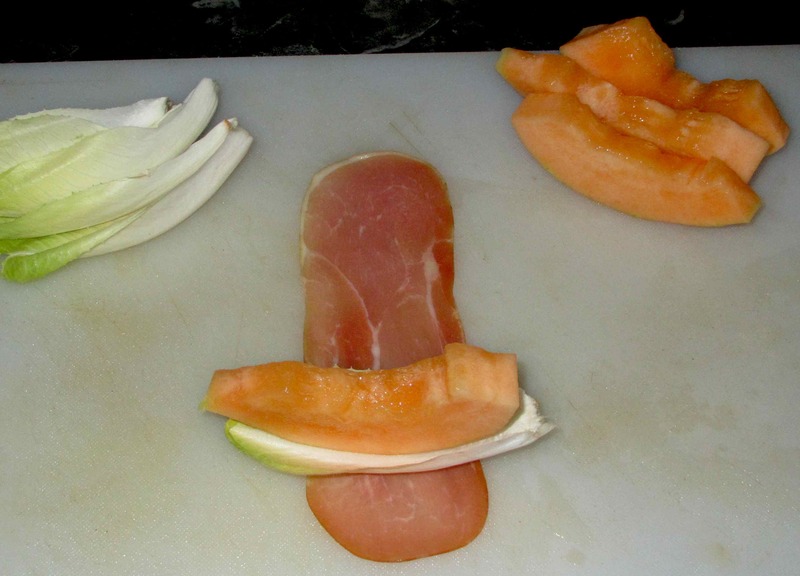 Prosciutto and melon is one of my favorite meals in the summer time. I have never thought to cook it or serve it warm, but why not! I have cooked it in stir-fried dishes and also made sauce with cantaloupe before. Sometimes our experiments aren’t as successful as we wish. I like your combination of ingredients and would probably serve the appetizer without grilling it. I had a similar problem grilling prosciutto. I thought it would turn out great but it ended up turning tough. Still, you made a valiant effort! I’ve tried it on shrimp with good effect before … I think it may depend on the prosciutto in question. Love the combination… sweet & salty! Delicious! When using very good prosciutto (which is probably difficult where you are) it would be a waste to grill it, but I like your creativity. You are absolutely right that getting proper photos is harder or at least a different skill from the actual cooking — but important for a food blog. Excellent post. I love when we admit our failures. You can only get it better in future. Go for it! I will try it again… just needs further thought.